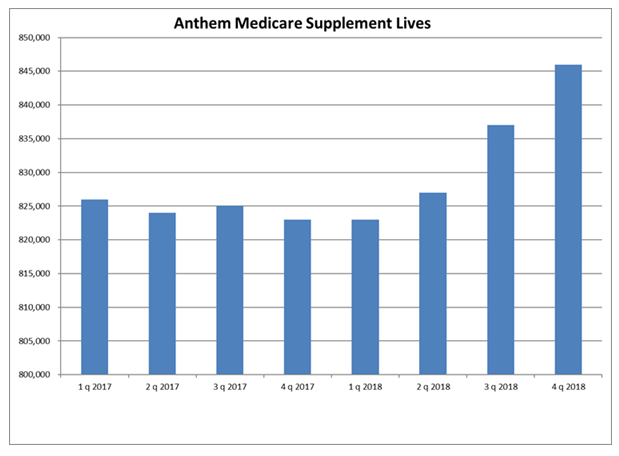 Anthem, Inc. released 4th quarter 2018 financials on January 30th, adding 9,000 Medicare Supplement lives in the 4th quarter and 19,000 Medicare Supplement lives over the past two quarters. The Anthem enrollment table below features Medicare Supplement policy in-force counts of 846,000 as of 12/31/2018, a 23,000 increase in the past 12 months. The 23,000 lives growth in 2018 is a 2.8% increase over the in-force lives at year-end 2017. CSG Actuarial projects Anthem’s Medicare Supplement sales at 5th in the overall market in 2018.